In 2014, the FBI announced their plans to launch a massive database containing 52 million images of faces, in order to keep tabs on Americans through a biometric facial recognition program known as Next Generation Identification (NGI). However, according to an exhaustive report by the federal Government Accountability Office (GAO), the program is far larger than they claimed, and ominous. According to the report, the system actually contains about 411 million photos, only 30 million of those are “civil and criminal mugshots.” The overwhelming majority of images in the FBI database are of innocent people. 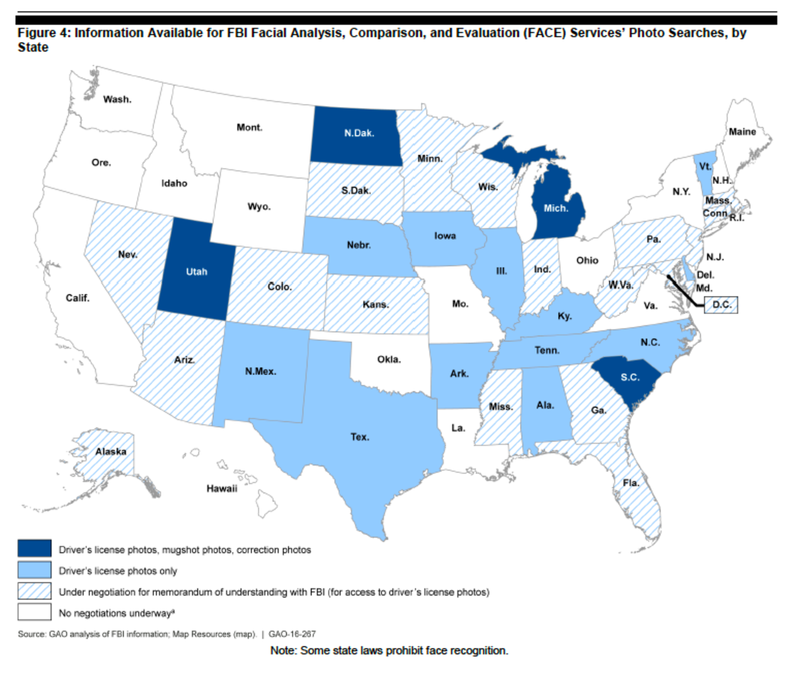 According to the GAO Report, as reported by the Electronic Frontier Foundation, FBI’s Facial Analysis, Comparison, and Evaluation (FACE) Services unit not only has access to FBI’s Next Generation Identification (NGI) face recognition database of nearly 30 million civil and criminal mug shot photos, but also has access to the State Department’s Visa and Passport databases, the Defense Department’s biometric database, and the drivers license databases of at least 16 states. Totaling 411.9 million images, this is an unprecedented number of photographs, most of which are of Americans and foreigners who have committed no crimes. These images, according to the report, were arbitrarily scooped up in a massive data collection and have nothing to do with national security or criminal behavior. As the map above shows, 18 more states are in negotiations with the FBI to provide similar access to their driver’s license databases. The agency has done nothing to make sure innocent people are kept out of their search results, according to the report. As EFF notes, face recognition is notoriously inaccurate across the board and may also misidentify African Americans and ethnic minorities, young people, and women at higher rates than whites, older people, and men, respectively. The FBI has been hiding this information from the public as well, in egregious violation of federal law and the FBI’s own policy. According to EFF, the GAO report criticized the FBI for rolling out these massive face recognition capabilities without ever explaining the privacy implications of its actions to the public. Federal law and Department of Justice policies require the FBI to complete a Privacy Impact Assessment (PIA) of all programs that collect data on Americans, both at the beginning of development and any time there’s significant change to the program. While the FBI produced a PIA in 2008, when it first started planning out the face recognition component of NGI, it didn’t update that PIA until late 2015—seven years later and well after it began making significant changes to the program. It also failed to produce a PIA for the FACE Services unit until May 2015—three years after FACE began supporting FBI with face recognition searches. As GAO notes, the whole point of PIAs is to give the public notice of the privacy implications of data collection programs and to ensure that privacy protections are built into the system from the start. The FBI failed at this. “The FBI fully recognizes that the automated nature of face recognition technology and the sheer number of photos now available for searching raise important privacy and civil liberties considerations. For that reason, the FBI has made privacy and civil liberties integral to every decision from the inception regarding its use of face recognition technology,” the bureau added. Apparently, keeping a massive database of facial images of innocent Americans to spy on them using hidden cameras for unknown reasons is “protecting privacy and civil liberties” if you are the FBI. It seems the U.S. government knows no limit as to how low they will go to ‘protect’ you from terrorism. The state’s tendency of problem, reaction, solution only serves to erode liberties while furthering the problem. If the U.S. truly had any interest whatsoever in preventing terrorism, they would stop creating it.